If you’re like most people, chances are that watching TV is one of your top time-passing activities. According to California State University, the average American watches more than four hours of television each day. In our lifetimes, we’ll have spent nine years watching the tube! However, there’s more to watching the TV than just turning it on and plopping on the couch. Getting the most out of watching requires the right environment, including darkness, no distractions, and nearby remotes. However, did you ever consider if watching TV in the dark is bad for your eyes? There are risks to watching TV in the dark. Keep reading for everything you need to know. Watching television in the dark can cause higher levels of eye strain. This is mostly due to the contrast between the light from the bright TV with a pitch-black room. The contrast in light may cause discomfort and visual fatigue. Dark rooms and bright televisions can also contribute to sleepiness and difficulties focusing. Also, the lighting emitted from the TV is always changing. The brightness changes with each scene or background that comes on, and from when the program shifts from a show to a commercial. This requires your eyes to constantly adjust to different lighting levels. A study by Rensselaer Polytechnic Institute’s Lighting Research Center revealed participants experienced less eyestrain and visual fatigue after watching television against an illuminated wall. Visual discomfort, blink rates, and reaction time of brain waves to stimuli were used to assess participants’ responses. Aside from eye strain, watching television in the dark makes it much harder to keep tabs on the remote controls. There’s nothing more stressful than misplacing the TV remote! 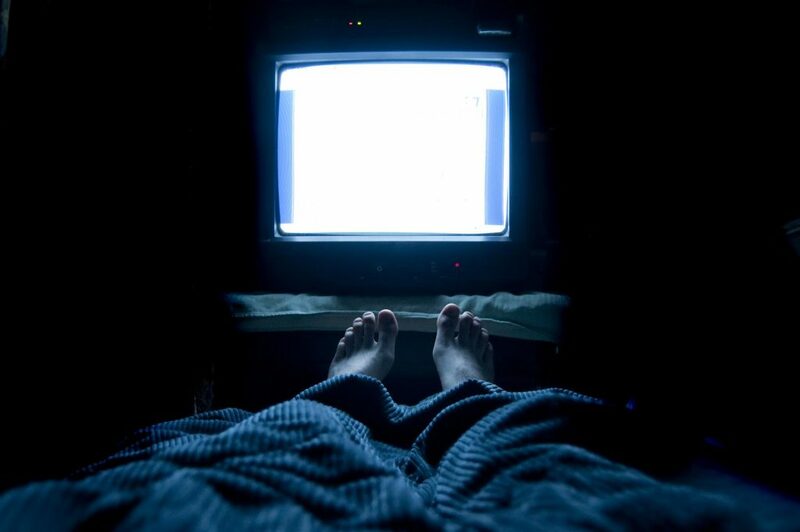 Watching TV at night can make it difficult to sleep, especially if it’s the only source of light. It can affect your circadian rhythm, which is, in part, controlled by bright light that’s interpreted by biological processes as sunlight. Blue light from televisions and smartphones can reduce or delay melatonin production. This is significant because the hormone is essential for getting a good night’s sleep. Widely considered a form of light pollution, blue light has been linked to not only sleep disorders but also cancer, depression, diabetes, and other diseases and conditions. While watching television can strain the eyes and cause headaches, rarely is watching TV so bad for your eyes that it causes permanent damage. Dark rooms and bright screens also shouldn’t worsen any existing eyesight issues. If you’re wary about placing too much strain on your eyes, turn on a dim light within the room. This way, you’re not sitting in complete darkness, and the contrast in light isn’t as steep. When using a light while watching TV, be sure to position the light so that it doesn’t create a glare on the screen. By using just a little bit of light, you not only lessen the strain on your eyes but also minimize the risk of misplacing your TV remote control. Without the remote, you can’t customize your TV-watching experience to meet your needs. The convenience and importance of having a functional remote cannot be overstated. Whether you’re in the comfort of your own home or the owner of a hotel, having access to remotes to control the channel, volume, and input is a must. If you’re looking for new remotes or need to replace a missing one, we’re your go-to source for hospitality remotes. We can even help with remote control codes, including TV codes for a universal remote. There’s more. At Replacement Remotes, we also offer the best deals on TV stands, sound bar systems, tuners, security cables, and more. Even search for the best deals on TV wall mounts for the most flexible installation possible! Get the most out of your TV time! If you’re looking for a remote control, the best rotating TV wall mount, or the best prices on TV stands and other products, our team at Replacement Remotes can help. Contact us today at 1-855-573-6683!